The Husqvarna 445 provides a lot of value for homeowners. The Husqvarna 445 is a fantastic well-rounded chainsaw that’s been engineered for homeowners who need a balanced saw that’s also easy to use. 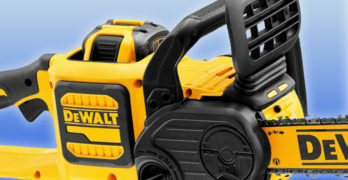 This gas chainsaw is relatively lightweight and starts immediately every time, whether hot or cold. It’s been designed with a long list of excellent features that I’m sure you’ll grow to appreciate over time. Powered by Husqvarna’s 44.7cc X-Torq engine, it has the right amount of power to take care a majority of your needs around the yard. This isn’t a logging saw, it’s for homeowners who want professional quality within a reasonable budget. 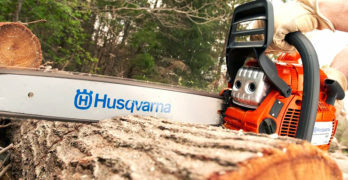 Husqvarna is one of those brands that consistently delivers on quality and performance while keeping the prices still reasonable for homeowners. We’ll get into the specifics in a moment but I just want to stress that this is a very comfortable chainsaw to hold in your hands and work with for long periods of time, which I’m sure you’ll appreciate. On top of that, the Husqvarna 445 has been engineered with safety in mind making this a great choice for the average homeowner. Loaded with very practical and useful features. I could go over all the features but it’s much easier to show you, as I have with the image above. Also, you’ll find more detailed information at the end of this article. One of the key indicators of a quality chainsaw is the inclusion of anti-vibration technology, which you rarely find on cheap chainsaws. The Husqvarna 445 incorporates proprietary anti-vibration technology to protect you from Hand-Arm Vibration Syndrome, which I wrote about extensively in my article on anti-vibration gloves, which are also a good idea to give you a little extra protection. I always recommend buying a chainsaw with anti-vibration technology because over the long term a vibrating chainsaw can cause permanent damage and it’s not worth the extra money you save when you buy a cheap chainsaw without anti-vibration. Now, if you only use a chainsaw occasionally then it’s not as important of a factor, and the less powerful chainsaws also produce less vibration so you can get away without anti-vibration and still preserve your health and comfort. But on a powerful gas chainsaw like the Husqvarna 445 it’s absolutely essential. 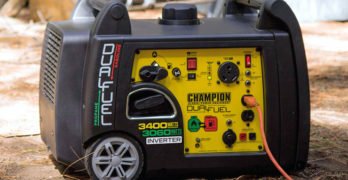 Another important feature of this chainsaw is the inclusion of an inertia chain brake which essentially means the chain will stop moving in case of kickback. It has a built-in sensor that automatically shuts off the chain when a sudden shift in upward motion occurs, giving you peace of mind as you work. I think it should be mandatory that all chainsaws have an inertia chain brake — unfortunately it’s not the case. I consider it to be similar to wearing a seat belt when driving a car. You’re taking a big risk if you don’t have a protective mechanism when things go wrong. If you’re uncomfortable at the thought of using a chainsaw — and many people are — here are two good alternatives that have been designed to be safer than using a chainsaw: The WORX JawSaw and the Black and Decker Alligator Lopper. 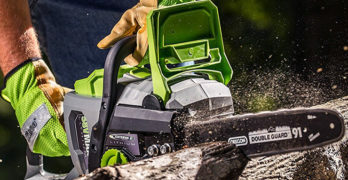 These tools aren’t as versatile as a chainsaw but if you only need to cut wood that is under about 4″ in diameter then these are perfect tools because they have been designed for homeowners who want to do their own pruning, limbing and felling small trees without the stress of using a chainsaw. They’re good products to consider. A close-up view of the Husqvarna 445. The Husqbarna 445 is Best for: Cutting wood and felling trees under 16-inches in diameter but truly excels at cutting wood under 12-inches. Cutting firewood, brushes and also limbing and pruning. It almost does it all. 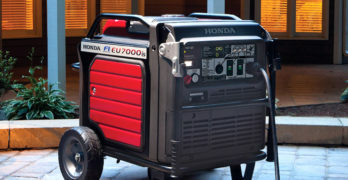 Best for light-to medium-duty cutting around the home. 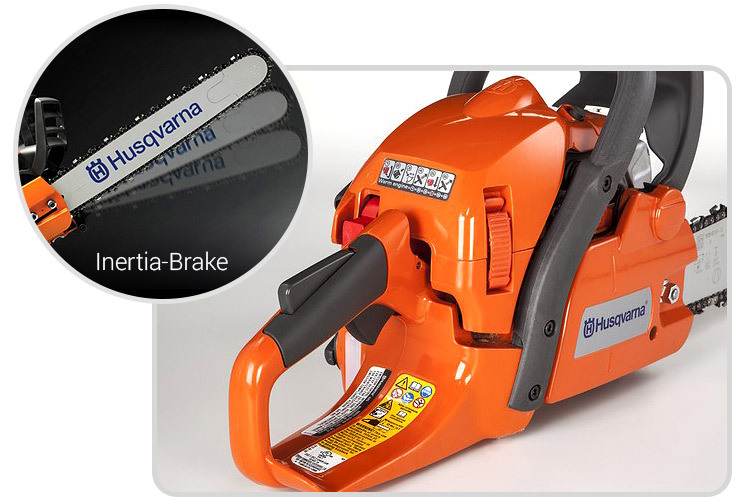 Learn more about the Husqvarna 445 at Amazon. 45.7cc X-Torq engine is clean burning and fuel efficient. Three-piece crankshaft is very durable and built to last. Centrifugal air cleaning system increases engine life by preventing dust and debris from reaching the air filter. Easy to start. Combined start/stop switch. Smart Start technology. Easy to remove air filter for qucik cleaning and replacement. Anti-vibration to protect your health and increase your comfort. Inertia-activated chain brake minimized kickback. Snap-lock cylinder cover saves you time when you have to change or clean spark plugs. Air purge technology takes out air from the fuel & carburetor system. Felling marks simplifies the process of felling trees. The Husqvarna 445 is a great chainsaw with more than enough power to keep your yard clean and manicured, not to mention cutting firewood whenever you need to. It’s made with homeowners in mind as it’s very easy to use with it’s smart start features, and more importantly it’s made with great safety features that will keep you protected as you work.